My favorite day is Sunday because lately it involves a good breakfast, bike-riding, and beers. Yesterday this was the breakfast that got my day going. It was a good start to a day full of sunshine. And I think I’m tan! … and by tan I mean kinda freckled. I want you guys to know something. I want you to know that nobody feels like the third wheel in this breakfast. 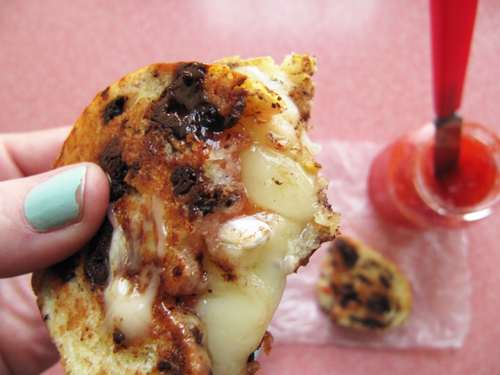 Strawberry jam, brie, and chocolate get along swimmingly. They’re all friends equally and they all fit on a sidewalk when walking. And when they’re all in a car they ride in the front seat. Nobody has to lean in from the back to be a part of the conversation. This combo make the best sandwich that can be either breakfast or dessert. 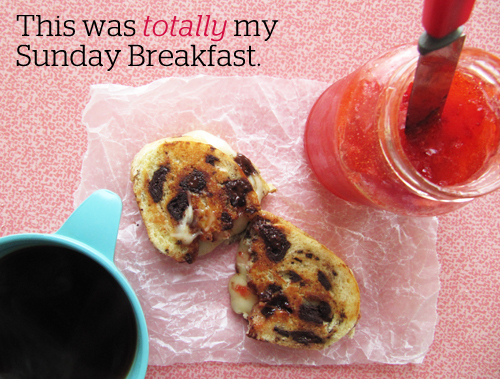 … and that statement sums up why breakfast is my favorite meal of the day. Butter the bread. Place a slice on a warm frying pan butter-side down. Top with jam, brie and more jam. Set the other slice of bread on top, butter-side up. Cook until toasted and melty. Flip and cover so the cheese gets super-melty. When both sides are toasted equally slide onto a plate and enjoy with your coffee. I thought that maybe the chocolate chunks in this loaf were too big. Who was I kidding?! You can’t have too much of a good thing. And it slices like it ain’t no thing. No big deal. And I totally made two loaves. One for savory sandwiching and one for sweet, but I always pick sweet over savory. Whisk together flour, a tablespoon sugar, and salt. In a 2 cup measuring cup whisk a pinch of sugar, yeast, and warm water together. Set aside for 5 minutes or until foamy. Whisk in oil and eggs. Add wet ingredients to the dry ingredients. Beat on medium speed for 3 minutes. Stir in enough flour to form a soft dough. Place dough in separate greased bowls, turning once to coat. Cover and allow to rise until doubled, about 1 1/2 hours. Punch dough down. Turn onto a lightly floured surface. Roll each into a small loaf. Tucking the sides underneath pulling the top taught and smooth. Place a few inches apart on a parchment lined baking sheet. Cover and let rise until doubled, about 30 minutes. Beat egg and water; brush over both loaves. Sprinkle the plain loaf with poppy seeds. 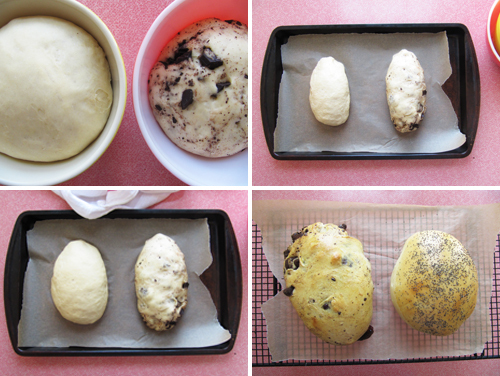 Bake at 375º for 10 minutes. Tent with foil and continue baking 10-15 minutes or until golden brown. Remove from pan to a wire rack to cool. 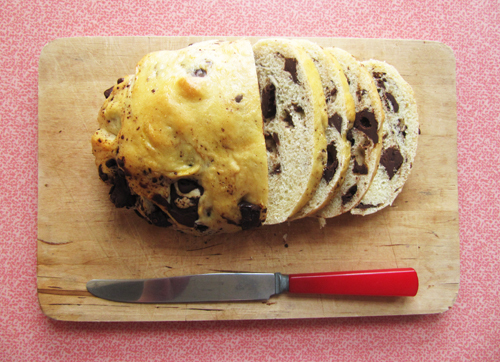 * I say to knead it into half because I’m assuming that you might want one chocolate-free loaf for savory sandwiches. I want every meal to contain brie and every day to contain sunshine. P.S. 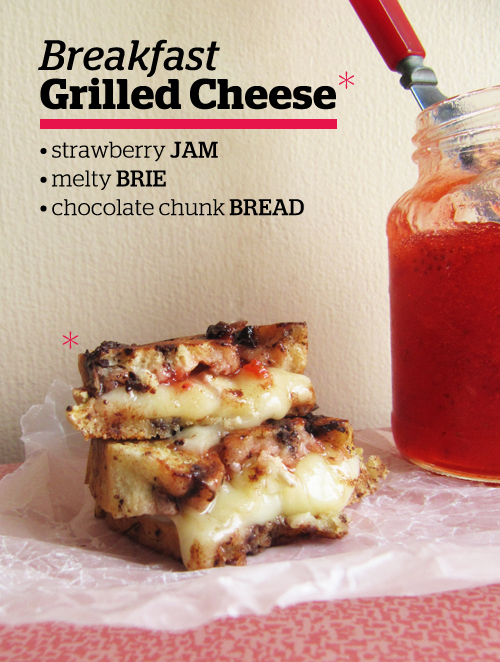 Do you love grilled cheese? 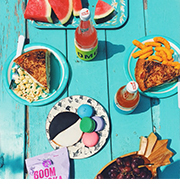 Check out my grilled cheese party from over the summer! 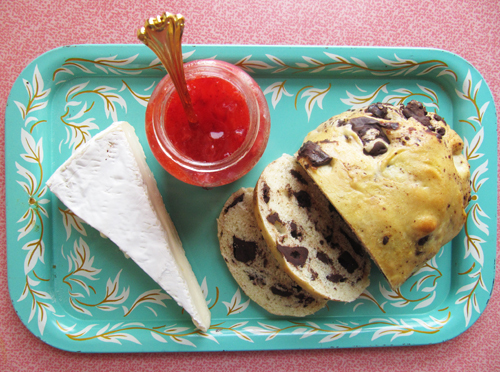 Cheese and jam and chocolate…..what a lovely and unusual combination. Good luck with the bread baking! I have total confidence in you. this looks amazing! now I just want chocolate in my yeasted breads. you just have good ideas girl. Oh my gosh, why did I just eat oatmeal for breakfast when I could of had this??? Oh man! I hope your oatmeal was good though! You should have this for lunch! Why not, right? That bread looks amazing! My favorite type of grilled cheese is caprese grilled cheese. It’s so delicious! Thanks, Elizabeth! Oh, I bet a caprese grilled cheese would be so good! Especially in the summer. Yum! I’d wake up early for a breakfast like this! OMG! This looks so amazing! I love Brie and jam!! Going to make this for sure! Ooh I hope you do! Let me know what you think! !!! I hope you try it! Wow, all my favorite ingredients combine into one package! Can’t wait to try this. Great photography on this! Hey, I just linked this post as one of my favorites on my blog. Thanks so much for sharing. I need more chocolate and brie in my life. once you put this recipe up I knew I needed to try it! I just made the bread and can’t wait to try the grilled brie sandwich for breakfast 😀 thanks for sharing this recipe, it looks soooo yummy! 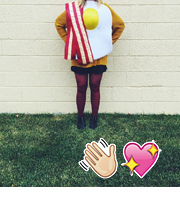 WOW, my sister and I will surely be making these next time we are reunited for a sleepover! LOVE the flavour combo… so naughty! Previous post: Happy St. Patrick’s Day Eve!